A 23-year-old Beverly Hills man was killed early Sunday after a high-speed crash off N Citrus Avenue where his car overturned several times. The man was driving a 2013 Hyundai Veloster north on N Citrus Avenue around 1 a.m. at a high rate of speed when the car left the roadway near W Sleepy Oak Court and overturned several times at the entrance to Crystal River Methodist Church, according to the Florida Highway Patrol. A passenger in the car, a 28-year-old Citrus Springs man, was taken to Regional Medical Center Bayonet Point with unspecified injuries. Authorities first believed the passenger died after being taken to the hospital. No further information regarding the crash is available at this time. 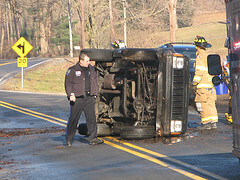 Rollover accidents are car accidents in which the automobile either turns on its roof or its side during the accident. While these collisions are often viewed as uncommon, statistics actually show that up to 35 percent of all motor vehicle accident fatalities occur in rollover accidents. The most common cause of a rollover collision is travelling at high speeds while driving on a curve. But, many things can cause a rollover accident, such as a high-speed collision with another vehicle, tipping after hitting a curb, driving on a slope or even a mechanical failure like a tire blowout. While SUVs, pickup trucks and vans are more prone to rollover accidents because of their center of gravity, all types of motor vehicles can rollover under the right circumstances. If you are involved in a rollover crash, your injuries could be quite catastrophic. In many rollover crashes the roof crushes inward, which can lead to brain damage, spinal cord injuries, broken bones or death. If you are injured or a loved one is killed in a rollover accident, understand that you have legal rights. You could have a potential legal claim against the driver of the vehicle in which you were riding or if another vehicle caused the accident, the driver of that vehicle may be legally responsible. A Citrus County Auto Accident Lawyer at Whittel & Melton can investigate your accident and determine what factors were involved that lead up to the crash. We will protect your rights and negotiate aggressively with the insurance companies involved. Your consultation is free and confidential, so you have nothing to lose and possibly everything to gain. Call us today at 352-726-0078 or contact us online.